ERGs are an effective tool in building research capacity in medical education and training, and allow us to partner with academic institutions. An exploratory qualitative study of the experience of GP supervisors and GP registrars in the management of older patients with chronic disease. The SRM was developed from a survey for clinical psychology trainees in the UK to capture the supervisory perspective on the supervisory relationship. A group of experienced GP supervisors from GPTT reviewed and adapted the survey for use in general practice and the AGPT program. A different group of GP supervisors piloted the instrument and gave it the green light, and GPSA conducted a survey of GP supervisor members. Measuring the educational alliance with supervisors from the registrar perspective. The SSMR was developed from a survey for clinical psychology trainees in the UK to capture the trainee perspective on the supervisory relationship. An expert advisory group of GP registrars from GPTT reviewed and adapted the survey for use in general practice and the AGPT program. 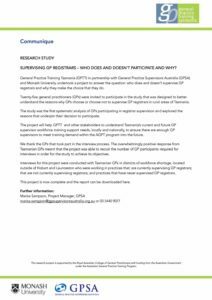 A second group of GP registrars from GPTT piloted the instrument, and gave it the green light, and GPSA is conducting a survey of GP registrars from GPTT and GPEx. Supervision – who does and doesn’t participate and why? This project aims to capture and understand the reasons why some people go into GP supervision and others don’t, as well as define the characteristics of each demographic. 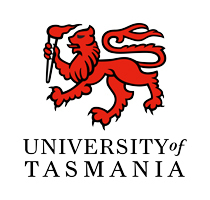 This project is being conducted by a team of researchers from GP Synergy, Discipline of General Practice, University of Newcastle, Eastern Victoria General Practice Training, General Practice Training Tasmania, Discipline of General Practice, and Primary Care Clinical Unit, University of Queensland, and the Department of Health and Human Services, University of Tasmania. 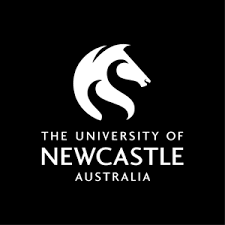 The purpose of this research is to develop greater understanding of the post-training outcomes for early-career GPs. 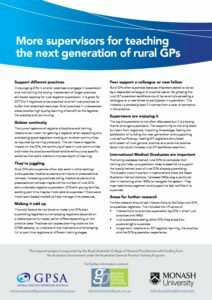 From a workforce planning perspective, it is critical to establish whether GP graduates continue to work in general practice, where they work, and how they work. We also wish to explore the possible influences of training experiences on early-career GPs’ practice. 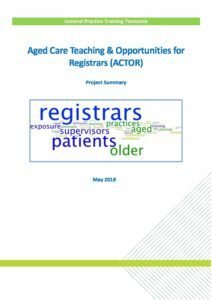 It is important to establish the relationship between early-career work practices and training-experiences to assist Regional Training Organisations in best preparing their registrars for unsupervised post-training practice.